If we conducted a survey to ask the question what is intelligence, we would probably receive so many different answers that we’d be none the wiser. But it’s safe to say that if all the respondents were asked for examples, Stephen Fry’s name would be high on many of the lists. 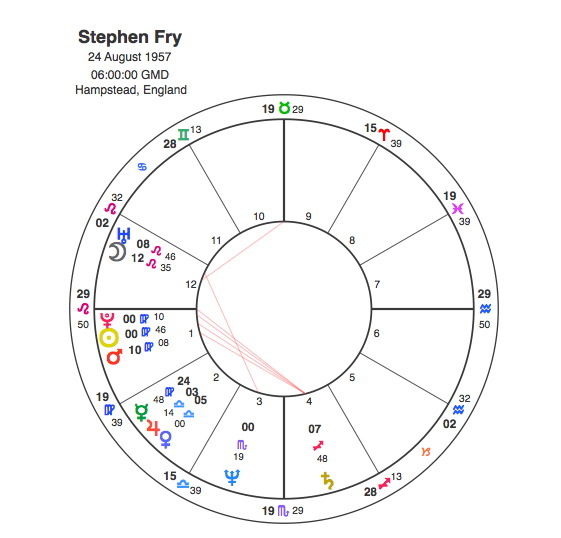 Stephen Fry is a Virgo but an exact Sun / Pluto / Ascendant conjunction all within one degree, makes him an unusually powerful one. Virgos are generally known for avoiding the limelight, preferring to work behind the scenes, but not this one. The Ascendant is about expression and planets close to it demand to be broadcast, the closer they are the more insistent the demand. Having the Sun so close to the Ascendant, but particularly with Pluto creates an intensity and power that produces the ubiquitous Stephen Fry, constantly on TV with one thing or another. The Sun on the Ascendant is just like the Sun in the beginning of Aries, it has tremendous initiating energy, it doesn’t matter what it does as long as it gets it out there. In some ways it would be fair to ask whether this is the chart of a Virgo at all, given that the Ascendant and Moon are in Leo, a sign that could not be more opposite. It is an interesting astrological fact that consecutive signs are very different to one another. The Zodiac cycle does have a definite progression, but this includes a situation where each sign becomes a reaction to the previous one. The Sun is in Leo during the hottest time of the year, when everyone is on holiday and having fun. Leo characters consequently seem to live life as if they were born to party. They have a natural ease and confidence, assuming that everything they want will come to them easily without undue effort because it is their right. They are natural leaders and they like to show their abilities and feel comfortable centre stage. The Sun moves into Virgo, just as the holidays end just as everyone goes back to school and work. It is harvest time in nature, and the one month of the year when more physical work is required than any other. No more resting and partying for Virgos, the corn has to be reaped and brought in, and the family’s survival over the winter months depends on the farmers efforts at this time. So the Virgoan is a reaction against the Leonian, who would be considered lazy and indulgent and far too impressed by their own performance. Virgo has a job to do and this requires a lot of self sacrifice. Its almost as if after 30 degrees, the Zodiac has had enough of a particular type so brings its opposite number in to clear up the old excesses. Virgos are generally known for doing all the work behind the scenes but also for not taking personal credit for their efforts, they are content for that to go to others. Leo’s are the opposite, often happily claiming the work of their subjects as their own. The combination of these two signs is intriguing. As a Virgoan, Fry works extremely hard, with Pluto and Mars conjunct the Sun, he is constantly beavering away at several projects at once. With the Sun conjunct a Leo Ascendant and the Moon in the same sign, this is not done behind the scenes, it is slap bang in the middle of many centre stages. As a double Leo, he certainly received the plaudits of which there are very many, but he does so in a quaint rather self deprecating Virgo manner. Fry’s enormous popularity is shown by a close conjunction of Venus and Jupiter in Libra, a combination that would create an extremely attractive personality. It would be easy to turn this article into a eulogy of Stephen Fry’s skills, how he has entertained us all through the delights of Fry and Laurie, Blackadder, Qi and many, many other perfect displays of his talents, but this is not the Capricorn Research remit. Its often the case that we can learn more about an individual and particularly about astrology if we look at their transits and how that impacts upon them, particularly if these involve difficult aspects in their charts. Everyone has to have problems to deal with, even if they have the Moon and Ascendant in Leo and a Venus / Jupiter conjunction in Libra, because everyone has a Saturn. Saturn is the planet that stops us and holds us back, it provides obstacles and limitations. In a way, people with a strong Sun or Jupiter or with Leo or Sagittarius prominent, can often find Saturn tougher to deal with because for a large part of their life they are not used it. This would be particularly so if Saturn was in aspect to the Sun and Stephen Fry has the square aspect. Fry has been diagnosed with bipolar disorder, specifically stating he suffers from cyclothymia, referring to it as “bipolar lite”. Bipolar disorder is the term for what was previously referred to as manic depressive illness, and has been intelligently covered in Fry’s own presentation of a documentary on the subject, The Secret Life of the Manic Depressive. The astrology of bipolar disorder would be an interesting piece of research to undergo, but the symbol of it in Stephen Fry’s chart would certainly be the intense almost manic Sun / Pluto / Ascendant conjunction in square to the depressive Saturn in the 4th house. This being the case, we would certainly expect it to be linked with major transits. One thing that is clear when dealing with anyone with a Sun / Pluto conjunction at birth, is that Pluto’s transit to square their Sun will be a time of tremendous upheaval and a turning point in their life. Pluto was square Fry’s Sun and Ascendant in 1995. The was a watershed year for him in a number of ways. It marked the end of TV’s ” A Bit of Fry & Laurie “,which had spanned four series between 1986 and 1995, and the collaboration with Hugh Laurie that had been a major part of Fry’s life since his University days. Stephen Fry had also struggled to keep his homosexuality secret during his teenage years at public school, and by his own account did not engage in sexual activity for 16 years, he once said relationships were for ‘other ­people’. This all changed when he began a relationship with Daniel Cohen in 1995. Perhaps the most significant thing that occurred under this transit, however, was what Fry himself referred to as a hypomanic episode. He was cast in a lead role in Simon Gray’s 1995 play Cell Mates, which he left three days into the West End run, pleading stage fright. He suffered a nervous breakdown and subsequently walked out of the production, prompting its early closure and incurring the displeasure of co-star Rik Mayall and playwright Simon Gray. After walking out, Fry went missing for several days while contemplating suicide but abandoned the idea and eventually resurfaced in Belgium. This is the only transit that Pluto has had to Fry’s Sun and Ascendant, and it is important to note that the planet would have made a conjunction to Saturn soon after. But in the absence of other Pluto transits it would be interesting to look at those of other planets. Neptune has a reputation for undermining even the most grounded of people, because it deals with the invisible realm and it seems to remove all our sense of certainty. It is often prominent at times of confusion, depression and even suicide. It appears that Stephen Fry’s Sun / Saturn square has led him to attempt suicide on a number of occasions, most recently in 2012 when he said that he took a “huge number of pills and a huge [amount] of vodka” and had to be brought back to the UK to be “looked after”. Neptune was opposite Fry’s Sun and Ascendant at the time. Stephen Fry has an extremely high IQ and is considered by many to be a genius, a fact that is probably caused by his Sun / Pluto and Moon / Uranus conjunctions. He has, however been extremely dismissive of Astrology, a viewpoint that he shares with many people who have taken no trouble to study the subject properly. It is, of course, very easy to trounce Astrology if one bases its critique on Sun sign columns, but Capricorn Research has yet to encounter anyone that has undertaken such a serious study, who does not incline to accept that there may be something in it. Virgoans are notoriously sceptical and its interesting to note that in Capricorn Research’s collection of 953 charts of astrologers, the combination of the Sun, Moon and Mercury scores by far the lowest in this sign out of all of them. It is common to view intelligence as the capacity to hold, categorise and process large quantities of information. If this is the case then someone with an exact Sun / Pluto conjunction in the sign would have to be acclaimed as a genius. However if there is one thing that Astrology shows us, it is that there are lots of different ways of seeing things. One comment that is often made about Virgos is that their obsession with details means that they have trouble perceiving the wood for the trees. In Stephen Fry’s case that could be because he’s so busy trying to be all the trees. This is not a one way street, however and many astrologers could learn a lot from Virgo. The Virgoan view of things might be useful to some devotees of Astrology that approach the subject in a purely Piscean manner. While Virgoans have difficulty seeing the wood for the trees, some Pisceans can get so absorbed by the wood that they get lost in it, being unable to distinguish the individual trees enough to navigate their way round efficiently. It would be interesting to note whether Fry’s view might change if the evidence of his own transits were placed in front of him, but it is hard to find room for a completely new way of seeing reality when your mind is so full of Quite Interesting information.